I had the good fortune to attend a spinning workshop by the amazing and inspiringJacey Boggs last summer, where she opened my eyes about the possibilities in handspun yarn. 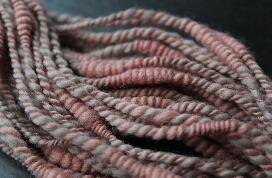 Here are some close-ups of a couple of the mushroom-dyed skeins I posted about a few days ago. The pink one, dyed with dermocybes (the darker shade was mordanted with iron), is spun with coils, while the green yarn, dyed with Hydnellum, is one thin strand plied with a thick-and-thin strand. 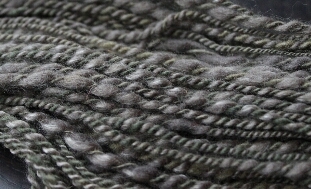 Now I have even more reason to fondle my handspun! What lovely colors, and what beautifully structured yarn. I’ve heard wonderful things about Jacey as a teacher. Lucky you! Yes, if you ever get a chance to take a workshop with Jacey, run for it! Our spinners’ guild brought her here last year as a memorial for one of our members who died, and it was one of the best workshops I’ve ever taken.